RC nice read as always. This is such a huge topic with plenty of things to consider. My first issue is with the star system itself. Unless these prospects are going to the same combine who is to say what is exactly their fair rating to begin with? I can go on one site and see that all of our kids with the exception of one of them are rated as 2 star prospects if they have been rated at all. In addition there are roughly 37,000 high schools in this country yet we only have 120 programs playing football at the D1 level. For the sake of argument lets say each of these schools keeps 100 players on their roster. That tells you that there are roughly 12,000 kids playing D1 football over a 4 year period but schools bring in talent on a yearly basis to meet the 100 player mark meaning they add 25 players per year x 120 schools = 3,000 kids per year out of 37,000 high schools. So in theory it takes roughly 12 high schools to produce 1 D1 prospect and I think its fair to say there has never been so much talent available yet it just shows how talented you must be to play at the D1 level. Sorry for being confusing here but it brings me to my next point about the star system. A 4 star kid out of Utah is not going to be the same as a 4 star kid out of Florida for the obvious reason of competition. The kid out of Utah might see 2 players with his skill set each season while the Florida kid will see that in practice each day and many more come game day. So all things being equal these prospects are not. Give me the average kid that competes against the best each day not the big fish in a small pond who runs up huge stats against weak talent. Another thing we need to remember is that these are 18 year old kids some of which hit their peak at age 15 while others have yet to scratch the surface. Some kids will come here with loads of talent and discover that they prefer to party and chase women while others will work 24-7 to make the most of their ability. The thing is you cant measure what is in ones heart, their injury situation, or how much talent is at their position of choice when they get here. I think at ECU we were suffering a messaging problem among prospects within the state so I fully support the re-branding efforts that are now underway. I will give TH plenty of credit for what he did and now I think JC will keep building from here. Since it is so tough to attract talent with so many schools around us I would like to see us develop a reputation for being the home of transfers or Jucos. That seems to be the only way to reverse the poaching problem. Lastly there cant be a tougher job that being a football coach. First to deal with the fan base who expect you to win every week is tough enough but having to depend upon an 18 year old for your job security is brutal. For years I have thought the massive differences in money from the have to the have not’s would be responsible for the destruction of the game but now I think this poaching of recruits might do far more damage to a program than lack of revenue. Imagine spending thousands of hours and dollars dating you wife only to have her dump you at the altar for someone else 2 days before the wedding. Then imagine this happening potentially 2 to 10 times each year with these kids who leave these coaches hanging. Schools and coaches plan this for years in advance and these kids give their word only to flip at the last minuet destroying all of the work that went into it. I have no trouble with a kid selling their services to the best situation for them but there has to be a better way to fix this. You know, your dating analogy is a very good one as this whole recruiting process is very much a courtship – including all of the costs associated with said courtship. I think you are spot on about the need for better messaging…and I have gone on in the past about our need to use our creative departments to really create a branding below the commercial level that reaches out to today’s 18 year olds. With what is going on at Cheater Hill, I have stepped back a bit on my take about wanting us to doggedly pursue the elite players…I think we should approach those who play positions of need for our team, but we should also burn little capital on them once we ID whether or not they have any interest in college beyond a place to display their talents for the NFL. I go farther then we go…how about we become the first program to put our money where our mouth is and start offering 4-year guaranteed scholarships? In principle, what is the message to an athlete when they are only offered a 1-year renewable (at the school’s will) scholly? The system, made to protect the schools, sort of creates the “Get mines” attitude that the kids all have today. I know it is not just the 1 year renewables, but right now, the messaging in general to top athletes is: 1) we only guarantee one year at a time; 2) we make a ton of money and you make that 1 year scholly and 3) we are going to recruit 2, 3 guys in your position alongside you. Sort of dog eat dog out there. I hate being left at the alter too…and it is particularly frustrating because the schools swooping in are clearly letting us foot the bill to uncover the hidden talent and then they – who have budgets four times greater for recruiting – slip in and parlay their brand (perpetuated by the BCS sham) and shine the light on life as a superstar at a big name school…how many 18 year olds can withstand that type of marketing? They are athletes afterall, driven by competition and in the case of the guys we find, are kids who probably have been feeling all along that they have been ignored by the name brand schools and then voila! in comes said big name schools finally seeing what the kid has known all along…very validating for a young athlete who has been feeling left out of the big-time mix. Look at Boneyard Banter after any NSD, there will be discussion about how our kid only had offers from (list generic, small schools here)…well, the kids themselves feel that, so what do we expect when ECU is the kids top offer so far, he commits, and then all of the sudden, Alabama, Auburn, and Tennessee come calling…doh?! I would like to see some of our Pirate brother/sister alums who have forged careers in marketing/advertising come forward and bring their talents to the table for the program…change our messaging and help get Ruff in the door of more talented athletes because I think he can close – IF THE KID really has any desire to get a degree. The other kids are a lost cause, unless we start cheating, IMO, because we have nothing to offer them otherwise. I really look forward to your comments DCP28…always chock full of interesting commentary…keep ’em coming. And…I really think that the Pirates will start to put more effort into the Maryland/DC area (along with the I-95 corridor up to NY/CT…which will bring a lot of talent in the door. Very good perspective and reality check on football recruiting. The day we are not battling for kids wanted by other schools higher up the food chain is the day I will start to worry. Agree the recruiting trend with Ruff is on a gradual trend up and that is fine with me. With regard to our transition to the AAC, noticed your suggestion of recruiting more in the northeast “where there are a lot of players who might start to call ECU a destination of choice”. If I read our current commitment list correctly, we only have one recruit further north than Virginia Beach and that one is from Silver Spring, MD. As someone who came to ECU from New York, I have always wondered why we did not recruit more in the northeast. Maryland, Pennsylvania, New Jersey and New York are no further away from Greenville than South Carolina, Georgia and Florida. Pirate fans with sufficient age have great memories from kids like Rod Coleman, Anthony “Tony” Collins, Luke Fisher, Dan Gonzalez, Leon Hall, Steve Hamilton, Scott Harley, Kevin Ingram, Greg Lefever, Mark Libiano, Matt Mulholland, Charlie Robinson, Jody Shultz, Anthony Simpson and Walter Wilson, for example. Speaking from experience, I tend to think we underestimate the appeal of East Carolina and Greenville to a young man and his family from the northeast. So, I too hope our exposure to the northeast as a result of joining the AAC results in ECU taking a closer look than we have in recent years to the talent in that area. Hell of a list there Chesapeake! I am so eager to see the Pirates play at the Link when they visit Temple in the AAC. I moved to southeastern PA in 1998 and since then, I have seen a huge growth of awareness of ECU in my area. It is a school of choice for kids looking to get away from home or find a reasonably priced college. I am surprised how many people I meet around my town who have a connection to our university and so I am convinced that we could really brand ourselves up the I-95 corridor and benefit both athletically and academically. I think the AAC will ultimately help us continue the up trend in recruiting if our staff and administration play it right. Good, even handed article. I think our staff are the best recruiters we have ever had at ECU. It is frustrating to be unable to land RB targets lately, but we are stocked at WR (look at how many played last season). And how many unc players had higher star ratings than ECU on Sept 28, 2013? I would wager 90%. Hello JR…glad you stopped in. Coach Logan really did nail it when he said that he would tell you how good a recruiting class he had in 4-5 years! Ruff seems to be finding kids with heart and that can overcome a lot. Great analysis. The TV exposure into the northeast should be helpful. Midwest even with Cincy. There is simply little reason for a fully qualified player to come to ECU if he has firm P5 offers so we have to do exactly what you are saying as our bread and butter. Ches’s point about distance is also a very good one. Why just look south when at the same distance are heavily populated Mid Atlantic and low northern areas? Established networks maybe but need to develop some new ones. We will have to upgrade our overall talent to win the AAC so a fine balancing act between trying to court some higher profile players to do so versus doing what you recommend over wider geographic but heavily populated areas. No more NQ with the AAC so that door is closed. Must adapt or sink to mediocrity. I so agree with the point about establishing new networks…and our staff is pretty young and diverse enough to do it. I like that Ruff and crew do not hesitate to go after the high profile guy, but like you stated, it has to be a fine balancing act. And, the NQ point is one that we all need to get our heads around as a fanbase…so the previous poster’s point about JUCOs is now much more important, IMO. As you know, mediocrity is not an option…so hopefully our admin and coaches are already mapping out a way to tap the future – and fertile – opportunities that the AAC will present. 106 ranking in recruiting is unacceptable. i understand everyone likes Ruff because he is former pirate but he should be able to attract better recruits. i don’t think he would recruit much better if we were in the acc. come on 106, we were ranked better before the aac. The only rankings which count are wins and where we stand in our conference. We have always recruited kids the BCS schools did not want or need based on how many BCS schools there are and the 85 scholarship limit. As long as we continue to win and continue to develop depth at all positions, the recruiting rankings just mean that someone’s opinion was wrong. Hey Chesapeake…glad you stopped in! Amen to that brother. Depth, desire, and frankly, in our case, kids with something to prove…can be pretty powerful. That said, RC’s sentiment is well taken…we need to eventually flip the more elite players our way. It may be that our new footprint gives us a better chance. Competing for elite players in NC (hate even saying this) is such an uphill battle, with UNC’s stranglehold on the top players (money established that trend), but perhaps we can pursue those top players in DC/MD, Southeaster PA, New Jersey, and part of NY now that we didn’t even try previously. On another note, would love to see our marketing be so out of the box that it rivals the USFL’s push into pro football. They were able to make the alternative simply COOL…we need to make ECU simply a cooler place to be to these blue chips. And frankly, the blue chips we pursue need to be academically eligible guys because we will never be able to compete for the ones that have no desire for college. Just my tarnished 2 pennies on that one. Love hearing from you Ches. rc…among many other things I dig about you is that you let it rip…no punches pulled and no hiding how you feel! I sincerely dig that. I agree that bottom-barrel rankings hurt, though I see it hurting the most in the perception side of things. I think that our goal as a program given our current inability to spend like the big boys and the fact that we don’t cheat on epic levels, should realistically be a full slate of 3 star guys with the occasional diamond in the rough we find hidden away somewhere. IF we were consistently a top 70 class, I think we consistently have depth and will outperform many programs above. To me, the bigger concern is attrition rate regardless of rankings. The rankings are skewed and will always be as long as money is involved. Sure, the 5 star guys are hard to miss with (providing that they do not have 2 cent heads on their shoulders), but below that, even the 4 star guys, sometimes are not so demonstrative in their impacts. Plus, the services cater to the bigger alumni bases (that is, the subscription counts). Imagine what would happen to their business model if the powerhouse, big-dollar programs all the sudden started having 30-50 ranked classes? The alumni base would flip out, rip the services for incompetence and cancel subscriptions…. Status quo = big money for these services; hence, we see guys magically bump up when they flipped from a non-bcs to a bcs and vice versa. it is a self-fulfilling prophecy program. Still, i would like to see our coaches pursue more established talent and begin landing more than the occasional transfer. Keep keeping us honest rc…it helps maintain an even keel. You nailed the business model of the recruiting services. Follow the subscription money and you will find their higher rated players. ECU just had a player visit who is from New Jersey. He has followed the Pirates and came to Greenville on a trip south on his own. No offers yet but a highlight video that showed him pancaking defenders left and right from his outside receiver position. He indicated that he wanted to come south to play. The AAC should enable ECU to cast a wider net in the Northeast due to the presence of UCONN, Temple and even Navy and Cincy though not actually in the NE. Simply more exposure in states where we are largely unknown now. Get them to campus and commitments will follow. We will almost always lose academically qualified prospects to schools higher up on the perceived pecking order as ego motivates most players, their families and high school coaches. It is like a funnel though in that you must fill up the top to get what you want out of the bottom. The input to our funnel is improving in quality. 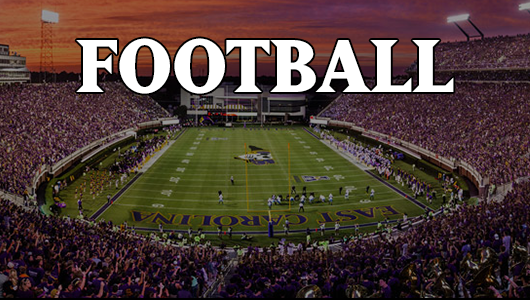 The rankings are virtually irrelevant to schools like ECU whose recruiting area contains a smaller population that attends smaller high schools in smaller towns. Just the way it is. Just getting to this one…I am very optimistic that that “wider net” can happen and probably with not much more effort than showing up by our coaches and some targeted marketing. I would also like to see the PC but a big effort into amping up chapters from DC/Metro area through to Connecticut and NYC (and surrounding burbs). I know that in the Maryland/DC area and in the South Jersey/Philly area (my area), there are not only a significant number of alums, but more importantly, a lot of kids going to ECU from these areas, allowing for some opportunities to get to mom and dad and grow the number of non-alum supporters. Plus, if we can put on a good product in 2014 to be witnessed by the new teams (ala UCF last year) we should be able to really leverage the new areas. Looking forward to seeing how our AD, Coaches, and PC play this out.